Impervious area includes constructed surfaces such as roads, sidewalks, and roofs which are impenetrable to water. The more impervious surfaces, the more runoff that is generated. There are, however, several alternatives to impervious surfaces such as pervious pavers, grass pavers, gravel and permeable concrete which will reduce runoff and mitigate existing stormwater problems. Dry wells are an underground structure used to infiltrate unwanted water into the ground. This is the most environmentally friendly solution for reducing runoff and improving the stormwater infrastructure in your area. Rain barrels are often overlooked as a stormwater solution. Connecting rain barrels to downspouts of your gutter is a way to store the rainwater and reduce runoff and erosion into your yard. Captured water can be used to water your yard or garden, as well as wash your car. If your property has steep slopes on it, the soil will struggle to absorb rainwater. This could likely lead to runoff and erosion problems in the near future. Ensuring a proper slope throughout your yard that flows away from the foundation of your home will allow the soil to absorb water and minimize runoff, therefore avoiding its negative effects. A berm is considered to be a raised barrier, used to slow run-off along steep slopes. This allows the soil to have more time to absorb water and to reduce runoff. A swale, on the other hand, is like a shallow ditch which can be used to direct water to a safe outlet, while absorbing and treating water along the way. Rain gardens are planted areas in shallow depressions, used to capture rainwater and filter it into the ground. Rain gardens are an easy way to manage excess water, and are perfect for water loving plants. It is a simple way to add an aesthetic look to your yard. Planting trees is a great way to manage stormwater runoff. The roots will absorb excess water and the canopy of the tree slows the rainfall, minimizing its effects. Additionally, planting trees will help remove pollutants and improve the surrounding ecosystem. Bare soil can be just as impervious to water as concrete. Covering bare soil with grass, mulch, or compost will help prevent erosion, slow the water down, and provide time for the soil to absorb more runoff. Adding organic material to your yard will not only improve water retention, but also provides nutrients to help plant growth. Adding perennials and shrubs is an easy way to help minimize and capture runoff. Planting native plants will develop extensive root systems used to absorb and hold water. Native plants are a cost-effective way to minimize stormwater damage, and are essentially maintenance free. Many gutter systems are not suitable to handle heavy rain and can easily clog with leaves, sticks, and other debris. Ensuring your gutter system is free of obstruction and draining properly during heavy rain is of upmost importance as a homeowner to prevent any unwanted damage. 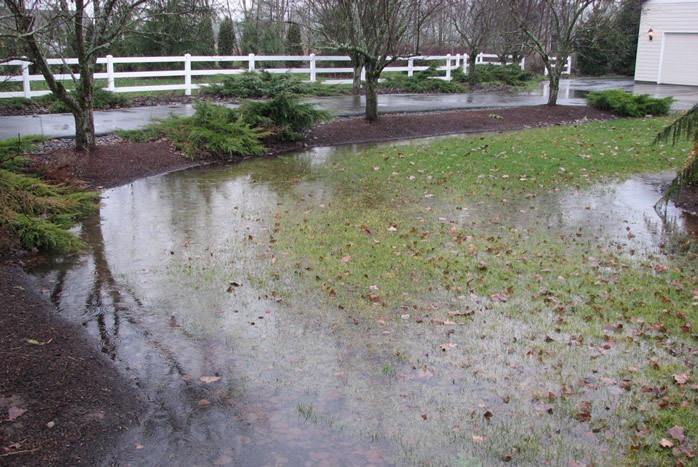 These tips and trick will help you to reduce stormwater runoff and future damage to your property. If you are thinking about litigation due to another party’s fault, need a Professional Engineer’s solution to solve a flooding problem, or want to a solidified plan to bid with multiple contractors, give us a call. We are Licensed Professional Engineers in every state in the southeast.